Metal has come of age and so has its practitioners. It’s weird seeing youth culture music still being played by middle aged family men who’ve head-banged their way to male pattern baldness. The two directors of Metallica: Some Kind of Monster reconnected with the group ten years after the infamous (and justifiably highly-regarded) film. Both are available on Netflix and make solid back-to-back viewing. 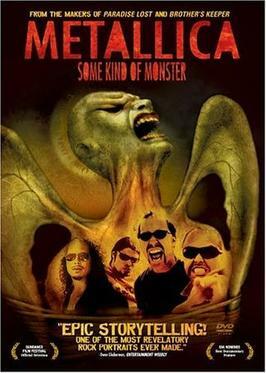 Always staunchly anti-music video (until they weren’t) Metallica embraced digital to the point where they were the subject of not one, but two films — the concert flick, Metallica: Through the Never and of course, Some Kind of Monster. The Monster metaphor of the lumbering Frankenstein may fit with popular misconceptions about heavy music, but Metallica’s lunk-head image always belied their musical sophistication. With their affectations they’re a heavy metal Morricone (whose The Good, the Bad and the Ugly theme precedes every show). However, Some Kind of Monster captures them at their artistic nadir, trying to will their way to creativity by discarding anything that previously made them successful. Although they’d be the first to deny it, music of all stripes requires a formula. And theirs was James bringing in a riff and a few scraps of lyrics into the studio, Lars adding some sonic touches and then the rest of the band shaping it into form. Going into a studio formless, meant no chain of command. No direction. And their jams here are those of a worn out bar band, “stock” as they themselves concede in several instances. Absent is the fire that blazed through Master of Puppets (a near-perfect metal song). And what we’re left with is internecine squabbling: with one another, their band’s 40k/month therapist, and with producer Bob Rock (who looks and sounds so much like Spinal Tap’s David St. Hubbins it’s unreal). It’s a fascinating look at the group’s individual personalities: singer James Hetfield and his sober-living solipsism, drummer Lars’ abrasive implacability and guitarist Kirk Hammet, the passive peacemaker and the group’s dispensable Ringo. This entry was posted in Documentaries and tagged movies and music, Movies from the 2000s by Really Awful Movies. Bookmark the permalink.